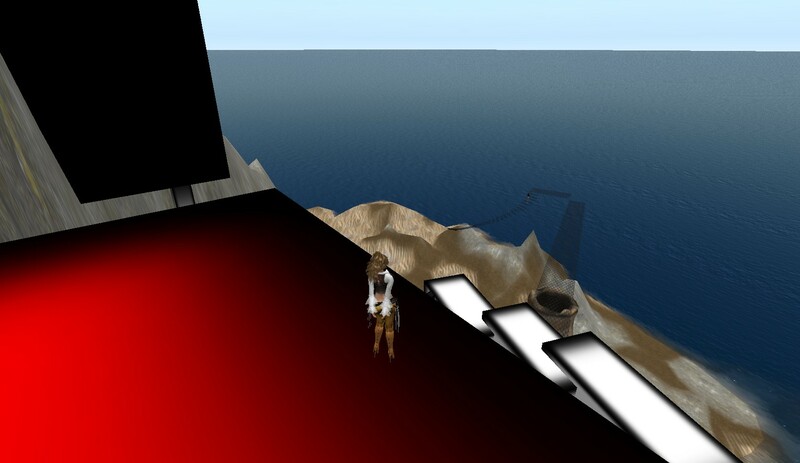 I initially began in Second Life to see if I might want to start a music club. I found out that would cost upwards of $400 a month for the “land” (bandwidth), and that would mean raising money and then that would mean looking for advertisers and then … it would become a JOB! So, other than playing in some dance clubs, I haven’t gotten too involved with Second Life, but one thing I’ve found which is pretty neat. Second Life is pretty good at advertising unusual “sims” (usually an island). I’ve checked out a couple of these sims and found them kind of interesting, but none really affected me until I came across “Imogen and the Pigeons.” The sim was created by Bryn Oh, and she is the author of the poems, as well. 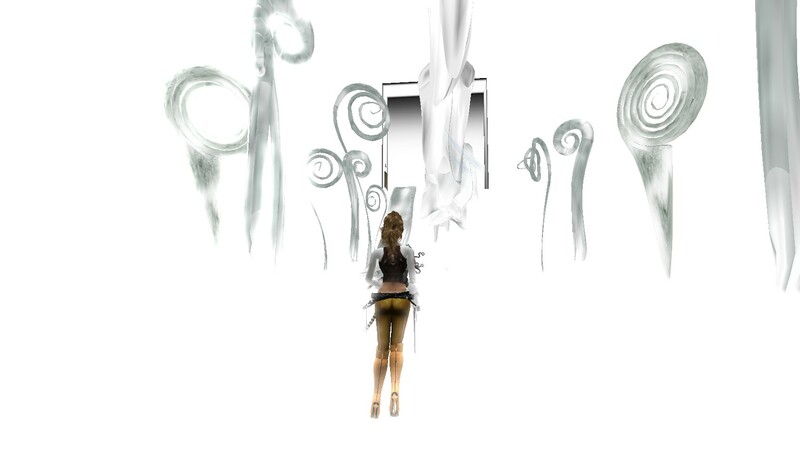 Imogen and the Pigeons is an amazing multi-discipline art/poetry exhibit in Second Life. It’s also a fun little maze and game to find all the poems in the sim. The poems and images are both very powerful and sad. 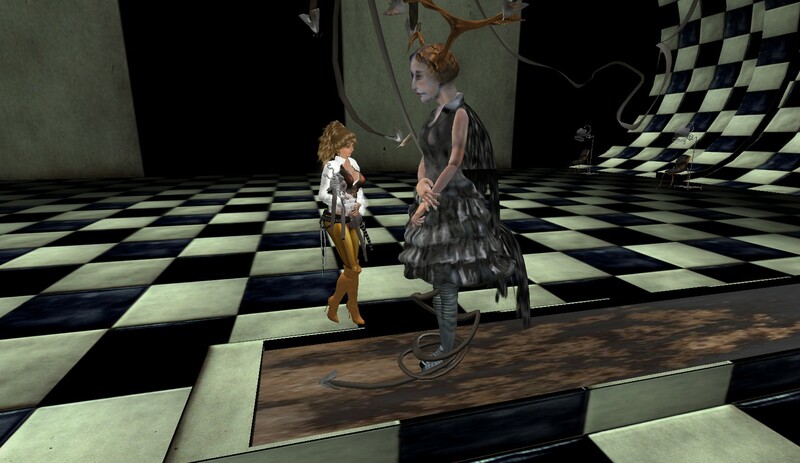 I came to realise of what kind of art could be possible in an interactive platform like Second Life. When I first showed up at Imogen and the Pigeons, I wasn’t sure how it worked or was supposed to work. You arrive on a beach with a lot of old junk lying around — old mattresses, washing machines, etc. I wandered around and found a statue that played a sad little tune if you clicked on it. No clues about what Imogen and the Pigeons were about. After a while, I found a flying chair. I kind of flew around in circles for a bit, but still didn’t come any closer to discovering the secret of Imogen and the Pigeons. A very helpful person then told me to fly the chair up higher, as high as I could. So I took their advice and did it, and sure enough that’s when I saw, curling around a couple of cooling towers, some stairway up into the sky. 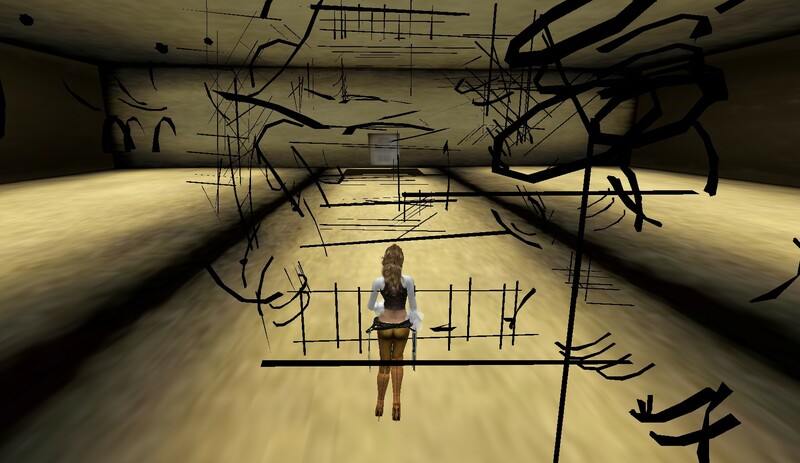 I finally figured out the way up the stairs is by using the arrow keys on your keyboard, rather than the movements arrows within the Second Life screen. By using my keyboard arrows, I was finally to get up the monstrous stairs without falling. You finally come to a bright red platform high above the beach … hundreds of feet up. Simple enough poem. But, the poems quickly become darker and more sad. Sad, oftentimes broken characters inhabit each room. Always alone, always seemingly isolated from the rest of the world in their dark rooms. because they fly like they’re broken. a place neither here nor there. The next room is another person lying on a bed. This time Imogen, and she is hooked up to IVs. She is ill. Is she dying, I wondered? You can hear pigeons cooing outside a window. This begins a series of poems about Imogen and the maze gets a little tougher. and I’ll learn to sing. Here, the sim gets tricky. There’s a couple of little clues about needing to pick up a pigeon’s feather to continue on. I picked one up and discovered that while holding a feather, you can walk up the walls. I walked up the wall to a window high above the floor, then I had to walk sideways along a curled path (sort of like a roller coaster). The first time I tried this, I dropped the feather and then I plunged 1,000 feet and went “Splat!” on the beach down below and was forced to start over from the beginning back up the stairs to the sky (Grrrr…!). I figured out not to drop the feather until I was sure I no longer needed it. Eventually, you enter a room full of mannequins and Imogen sitting in a corner sewing. Here, you enter a tough part of the maze. You have to walk along a ledge and you find Imogen down at the end of the ledge. After you find Imogen, you can drop down to a lower ledge. There is a rope to another ledge on the other side of an alley. I tiptoed across the rope (it looked hard, but you actually have an inch or so of leeway on each side of the rope.). And if you are successful, you are rewarded with a little Bryn Oh doll. I carried the doll with me through the rest of the sim. The next room is a creepy hair salon with a curved roof. You have to pick up another feather and walk up the curved wall to the ceiling, through a hole in a ceiling and into another room. Through a blindingly white room you find another poem. 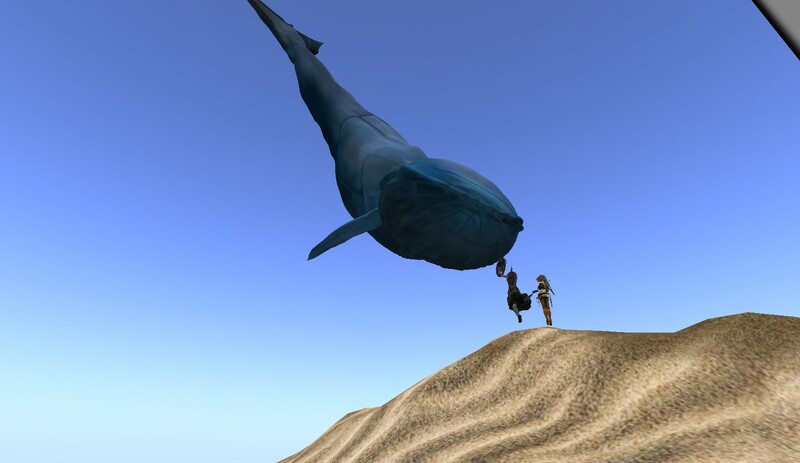 Just past this poem is an image of Imogen reaching up to a giant blue whale hovering in midair. That is the end of Imogen and the Pigeons.